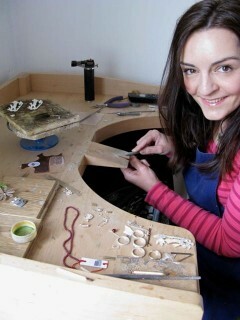 Jeweller Caroline Temple has worked for international design companies as well as regularly exhibiting her work in art galleries across the country. She has now launched her own website with her collection of beautiful hand-made jewellery available to view and buy online. Caroline Temple studied Jewellery and Silversmithing at Edinburgh College of Art and has worked for over 20 years creating stunning one-off commisions as well as wearable, yet exciting everyday pieces. Every piece is made in solid silver and gold, gem stones and genuine hand-fired glass enamel.